The new Lotus P1/01 AER was officially revealed Thursday at Le Mans, ahead of its scheduled debut for the second half of the 2014 FIA World Endurance Championship season in the LMP1-L classification. Five drivers, Christijan Albers, Christophe Bouchut, Pierre Kaffer, James Rossiter and Thomas Holzer, have been placed into a “driver pool” to drive the No. 9 entry for the balance of the WEC season, starting September 20 at Austin’s Circuit of the Americas. Specific races and driver pairings will be announced at a later date. The P1/01 is an entirely new tub, with no carryover parts from the previous T128 LMP2 chassis. The car was designed both in England and Germany, assembled and built in Germany and has primarily central European suppliers, although the car is entered under Romanian license. Boris Bermes, LMP Head of Operations for the Lotus LMP Team, explained the delay in both testing and racing this year was put down to a change in engine supplier, as the Lotus entry has inked a deal with AER. The engine will be between three and four liters, although Bermes did not confirm the exact capacity. He also confirmed the new chassis completed its crash test in April. “We had an agreement with another engine manufacturer, a new brand, but then in December than they had to remove themselves as they didn’t have the capacities to build the engine,” Bermes said. The team’s testing program has been confirmed internally, with Bermes only going so far as to say the first test would be in the “coming weeks.” The car is on display just today here in Le Mans. Meanwhile Bermes declined to comment on whether Colin Kolles is still involved with the team. As for the drivers, Bouchut, Rossiter and Holzer were part of the Lotus LMP2 program last year and Albers and Kaffer have past LMP1 experience among their varied sports car careers. 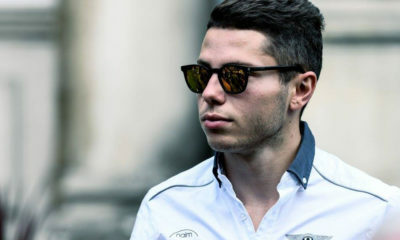 Kaffer anticipated that he’ll be in the car towards the end of the FIA WEC season, owing to potential other North American and European commitments.